Stained or yellowed teeth can affect your self-esteem and self-confidence. If your teeth are discolored due to age or tobacco use, or they have been stained from drinking dark beverages like coffee and tea, teeth whitening can give you a bright smile again. Teeth whitening options from Olentangy Modern Dental are the perfect way to restore your smile and feel great about your pearly whites again. Dr. Gavin is an expert cosmetic dentist, and she offers effective, affordable teeth whitening services for patients in Lewis Center, Delaware, and Powell. Teeth whitening products use active ingredients called peroxides. The two most commonly-used peroxides are hydrogen peroxide and carbamide peroxide. These compounds have a very volatile composition that reacts to organic surface stains on the teeth. When this reaction occurs, the chemical bonds that hold the stain onto your enamel are broken. In turn, this “bleaches” the stain away. Both in-office and take-home teeth whitening will offer similar results. The main difference is the speed of your treatment. For in-office whitening, Dr. Gavin uses KOR and Zoom products. These highly-concentrated whitening compounds are used with a special UV light to boost their potency and speed up results. With this treatment, you can get a smile that’s up to 5 shades whiter in just a single appointment. In contrast, take-home teeth whitening can take several weeks. Dr. Gavin will provide you with custom Opalescence or KOR teeth whitening trays. Then, you’ll wear these in the comfort of your own home. You will gradually notice the shade of your smile becoming brighter and brighter. Tooth stains and yellowing can make you look older. When you bleach these stains away, your teeth will be white and bright again, which provides you with a rejuvenated appearance. Unlike other treatments like veneers, teeth whitening requires absolutely no drilling or any other kind of surgery. Some patients may experience some additional tooth sensitivity after treatment but this will go away within a few days. Both in-office and take-home teeth whitening services are very affordable when compared to other cosmetic dentistry options. This makes it easy for you to restore your smile, even if you aren’t able to undergo extensive cosmetic treatment. Brighten Your Smile at Olentangy Modern Dental Today! 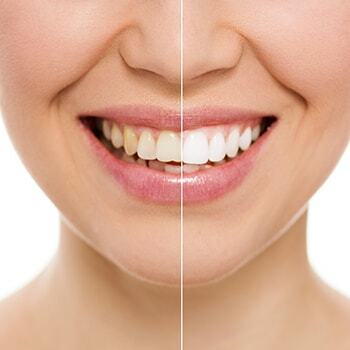 If you would like to restore your smile and are curious to learn more about teeth whitening and your other cosmetic dentistry options, come to Olentangy Modern Dental for an appointment today. Dr. Gavin will examine your mouth, and help you understand the best options for brightening and restoring your smile. Contact us now at (740) 200-5100 to schedule your appointment. You can also feel free to come to our office in-person at 7100 Graphics Way, Suite 3800, Lewis Center, OH 43035. Are you ready to meet Dr. Gavin and her incredible team?